In our area, the big fair is in town and the students will be out for "Fall" break this week. Pumpkins are everywhere and all the costumes for Halloween are in the stores! It is also funny how even our Goodwill store has a special Halloween store this time of year! As a teacher and administrator, my least favorite holiday was Halloween. Too much candy/sugar and way too much blood and gore for my taste! The students seemed to stay hyped up from mid October until Thanksgiving — I guess the turkey finally lulled them to sleep! But, I love the cool nights and mornings and of course all the football, band and cheerleaders! Fall is certainly a time for weather changes and anticipation! I hope all have stayed safe from the most recent hurricane — if you are mid west or west, you probably can't relate to all the evacuations, etc. What we have to remember is there are many children who are only fed consistently when they are in school so when we have these natural disasters, some of the most innocent suffer the most. Just a thought as we all start this new week. Great Instruction, Great Achievement. At the recent CASE/NASDSE joint conference in Milwaukee, we were so excited to introduce a brand new, standalone book by John O'Connor: "Great Instruction, Great Achievement for Students with Disabilities: A Road Map for Special Education Administrators." This book was really well received by the participants and just flew out of our CASE Booth! Dr. Stevan Kukic previewed the book and this is what he had to say about it, "What administrators need are resources that are succinct, readable, defensible, and, most of all doable. John O'Connor has given us the gift of a brilliant contribution. Using this resource will produce GREAT instruction for ALL students." Why not check this book out today on the CASE website! Speaking of flying off the shelf... Our newest Lucky 21 # 8: Medicaid in the Schools, a monograph about Medicaid in schools also made a big hit at the conference and continues to "fly off the shelves" here at the CASE office. This monograph was written by members of the National Alliance of Medicaid in Schools (NAME) with whom CASE has partnered in the past. This very practical monograph will answer 21 of the most often asked questions about using Medicaid in your schools. All our CASE members received a copy of this book free when it was published a few weeks ago! Not a member, then you can of course, purchase one or multiple copies! If you think you are a member and still haven't received it, then contact me ASAP so we can check it out! It's time to start planning for the February CASE Hybrid! Just think about what it will be like the week of Feb. 20 where you live and what it will be like on the warm, white sands of Clearwater Beach, Florida! If you ever attended the CASE Winter Policy Institutes, you might remember the lovely Sheraton Sand Key Resort! Though, the hybrid isn't run the same way, this is still a great location for any meeting in February no matter where you live! The room link is already live so go ahead, start planning that winter get away! The content for the 2017 Winter Hybrid conference will once again be just what you need in your district! We will have the first day on practical applications for schools in the area of Mental Health services and the second day will be on legal issues generally and as it relates to Mental Health. Since it is a Hybrid Conference, if you can't get away to the warmth of Florida, you can host a virtual site — or better yet, you can host a virtual site AND attend in person! This conference format is perfect for maximizing your professional learning dollars since the registration for sites is the same as just one registration! For the virtual site, all you need is a room big enough for your participants, a computer/internet hook up, an LCD projector, and sound and you are good to go! Watch for more details in the weeks to come-Registration will be up soon! Save the dates now — Feb. 23-24. 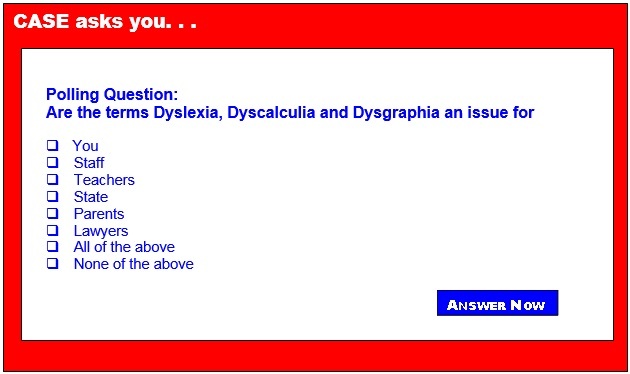 Last week's poll asked was supposed to have asked you about the terms Dyslexia, Dyscalculia and Dysgraphia. However, we had a little electronic glitch and many of you saw the same question you had the week before on Distributed Leadership! So, we are running the poll you were supposed to have answered last week again this week. This is an important topic and one CASE will be discussing with several other associations in the next few weeks. We really need to hear your thoughts on this poll! Wishing you a happy and fruitful fall for you, your staff and your students!